Sieur de Monts Spring is located along Route 3 just south of Bar Harbor and is also accessible by car via the start of the Park Loop Road. (See a detailed area map as these road intersections can get quite confusing.) Sieur de Monts Spring is a historical spring; back in 1909, the park's first superintendent, George B. Dorr, constructed the octagonal house over it to protect the spring and also harness the cool temperatures from the water. Dorr also oversaw the construction of several memorial stairway paths up his namesake mountain. Today, a large parking area welcomes visitors to explore the Nature Center and the original Abbe Museum, as well as stroll along the Jessup Path boardwalk into the Great Meadow to the north. For those with more vertical aspirations, the starts for the various Dorr Mountain east face trails are all located in the area. Emery Path is probably the most popular and inspired of the east face trails. The trailhead is located right behind the actual Sieur de Monts Spring. Follow the trail as it heads into the woods and zig-zags its way up the lower sections of Dorr Mountain. 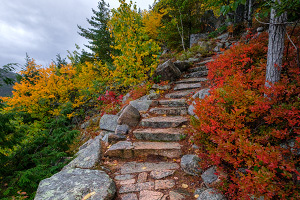 This trail is impressively engineered, consisting almost entirely of granite slabs and steps that work their way through the natural rock formations. After only about 20-45 minutes of hiking, you will reach a cool section of trail heading south on top of shelf with open views. Soon after is the junction with Homans Path. The trailhead for Homans Path is located right where the Jessup Path turns into a boardwalk at the junction with a dirt road. 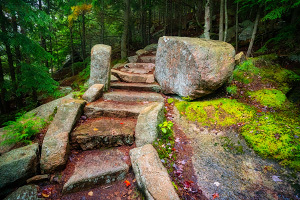 Similar to Emery Path, this traill has many granite steps that wind their way through interesting rock formations, including two narrow staircase sections that go under bridge-like granite slabs. After the second bridge, the trail heads into the woods and after roughly 20-45 minutes of hiking, we're at the junction with Emery Path. Continuing up the trail (still called Emery Path) are more open views as the trail loops back south. Then after the next switchback is probably the most notable feature of these trails: a set of steps that heads up a tall and narrow notch in the cliffs. The precise stonework going through the beautiful natural rock formations makes this a special spot, and a few formal sitting areas areas are just above the notch. Turning south again, the trail continues along its uphill staircase and soon enough, we're at the junction with Kurt Diederich's Climb. 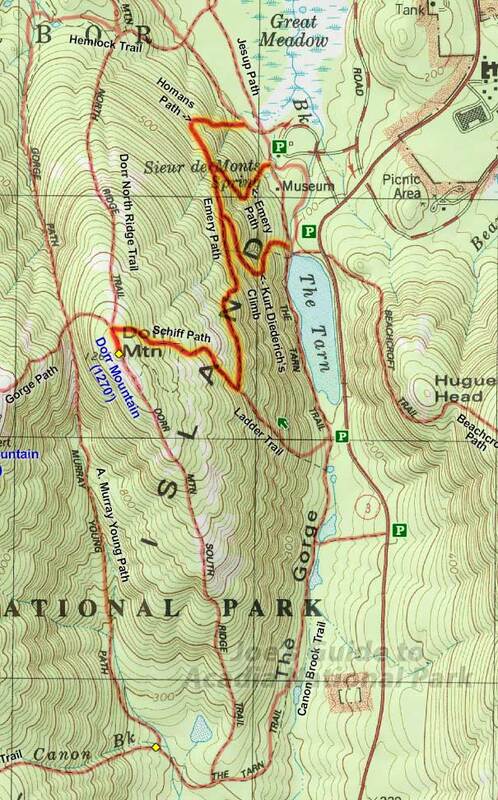 The trailhead for Kurt Diederich's Climb is located roughly ¼ a mile south of Sieur de Monts Spring at the northwestern corner of the Tarn. (The trail is also easily accessible from the Beachcroft Path trailhead along Route 3.) Aside from the standard wooden trailhead marker, "Kurt Diederich's Climb" is also etched into the welcoming granite steps. Despite the intimidating name, this trail is a pretty straightforward uphill hike and is probably the least distinct or memorable out of the three trails. But as you get higher, there are three nice little teaser viewpoints, the best one located right at the junction with the upper Emery Path. Continuing up the Dorr East Face Trail (still called Emery Path), the trail is very well maintained with granite steps, blocks, and non-stop scenic views. Soon enough, we pass the junction with the Ladder Trail (a spicier iron rung route that starts at the south side of the Tarn). The trail is now known as the Schiff Path and it heads west uphill to the summit ridge of Dorr Mountain. From the trail junction, hike south for a few minutes to tag the actual summit marker. From the summit marker, there are so many options for your return hike. You could return the way you came up and take one of the other east face trails back down to Sieur de Monts Spring; you could take the South Ridge Trail down and then hike back along the edge of the Tarn, etc. 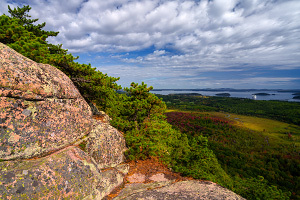 For those looking for a longer hike, continue west down to the Gorge Trail to hike to the summit of Cadillac Mountain. Each one of these little trails up the east face of Dorr Mountain is interesting, but if I had to choose one, I'd pick Emery Path as the most interesting. For those looking for a less strenuous and shorter hiking option, a nice little loop is up the Emery Path and back down Homans Path. This route hits some of the more interesting landmarks and offers some nice open viewpoints without having to hike all the way to the top of the mountain.